The Sixth Amendment contains rights beyond the well-known right to an attorney in criminal matters. There are six constitutional rights in the Sixth Amendment. They are procedural rights designed to protect an individual’s inalienable natural rights of life and liberty found in the Declaration of Independence. 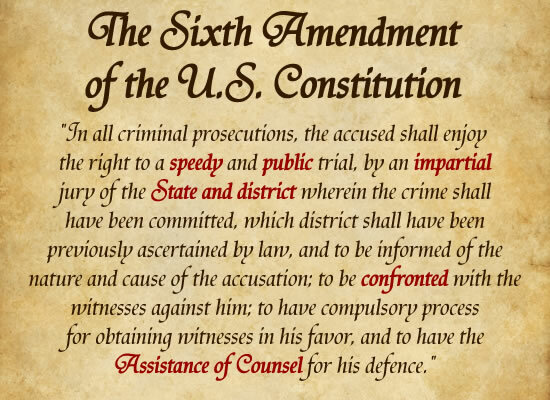 The Sixth Amendment is part of the Bill of Rights, passed by the First Congress in 1789, completing a promise of the proponents of the Constitution regarding limits on the Federal government to be added once the Constitution was ratified. The Bill of Rights was ratified in 1791. Originally these rights were only guaranteed to persons charged with federal crimes. The Due Process Clause of the Fourteenth Amendment has extended these rights to cover state criminal proceedings. The right to a speedy trial has been defined by statute in most jurisdictions, placing time limitations during which a criminal trial must take place, or else the charges must be dismissed. Reason for the delay: The government may not delay a trial for its own benefit, but a trial may be delayed for the testimony of an absent witness or other practical reasons. Time and manner in which the defendant has asserted his right: If a defendant agrees to a delay or causes it himself when the delay is beneficial to the defendant, he cannot later claim violation of his speedy trial right. Degree of prejudice to the defendant by the delay. The public trial right is not absolute. The prosecution or defense may request a closed trial. The right to a public trial must be balanced against the right to a fair trial. If the court finds a public trial will interfere with the trial’s fairness, the proceedings may be closed. These are rare circumstances. The jury trial right depends upon the offense charged. Charges with a potential penalty of less than six months in jail, carry no right. The place of the trial and the jurors are to be selected from the area where the crime was committed. An impartial jury consists of unbiased individuals, and the jury selection process of voir dire, allows the prosecution and defense to question potential jurors in an effort to discover juror bias. An attorney may challenge a juror’s service for bias, and if the judge agrees that juror will not be on the jury. Voir dire is a complex process designed to select a jury that does not favor either side. After bond has been set, typically the first formal court proceeding after an arrest is an arraignment. At arraignment the defendant is told of the charges in the indictment. The indictment must allege all elements of the crime with such precision that the defendant would be able to avoid double jeopardy if he were to be prosecuted at a later date for the same actions. This provision is commonly known as the “confrontation clause”. The defendant’s right to question witnesses against him grows out of the rule against hearsay. Hearsay is a statement made out of court about a fact relevant to the case by someone other than the person testifying. Since the defense cannot challenge the credibility of the person not in court, hearsay cannot be used in court. A defendant can have the court order witnesses to appear for the defense. A court will issue a subpoena for defense witnesses upon request. The courts have ruled that a defendant has the right to an attorney once judicial proceedings have begun against him. The extent to which this right is in effect has been expanded over time. A critical case in expanding the right to counsel was Gideon v. Wainwright in which an indigent man wrote the Supreme Court from a Florida prison about how he was convicted without counsel. That case extended the right to counsel to state courts, resulting in the system of Public Defenders throughout the country. The right to counsel has also been incorporated into the well-known Miranda warnings along with the Fifth Amendment‘s right to remain silent. Sixth Amendment rights are positive law rights, created to protect the natural law rights of life and liberty. If the government is attempting to punish someone by taking away their liberty Sixth Amendment procedures must be followed for the actions of the government to be legal. A defendant may request a “change of venue” if there is evidence that he would be unable to get a fair trial in the place where the crime took place. The court may require the defense to show the witnesses are relevant to the case before issuing the subpoena. There is the common law, which is the accumulation of judicial opinions. Positive law has been written by a legislature as a statute or ratified as part of a constitution. The right to benefit from the fruits of one’s labor is a natural right as well. If, as punishment for a crime, the government seeks to impose a fine, the government is moving to seize a person’s property. Sixth Amendment procedures exist to protect an accused property rights as well. Or in the case of a capital offense, execute him and take away his life. The duty of defense counsel is to be certain that the government follows the law.